The ornamental grasses are looking quite ragged by the time spring rolls around. 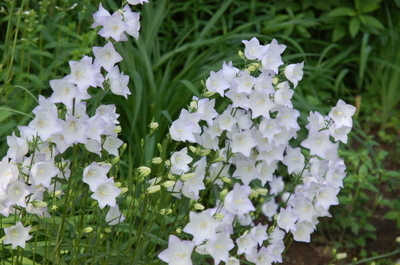 Most people cut them down which is laborious unless you possess a weed whacker with a blade. I have several clumps of grass and these by the fish pond stand alone, away from any structures or other plants so my preferred method of maintenance is to burn them. Burning reduces the grasses to black char very quickly. From start to finish might take a minute and a half or so. Wednesday is often 'pizza night' here with the neighbors and because burning grasses are such a spectacle it is a plus to have an audience when they are burned. This was Gibbs' first official Burning of the Grasses and he was on a leash since he is a bit ignorant at his young age of the power of fire. Controlled burns were a part of my youth. The local farmers would burn the fields to sweeten the soil and rejuvenate the fields. That vivid green arising from blackened fields seemed almost miraculous to me when I was small. These grasses provide a screen at the back of the fish pond and give a sense of enclosure as they mature. If you burn your grasses it is important to take a bit of care and have a hose, a rake and some people on hand just in case. The fire is incredibly, impossibly hot and it is fast. I cannot imagine what a prairie fire must be like and I always have a renewed respect for firemen after experiencing the heat of the flames generated by the dry grasses. 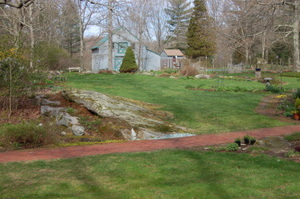 Here is the grass garden behind the pond after the burn. Neat and tidy with minimal effort, a night of entertainment and the added benefit of sweet char. 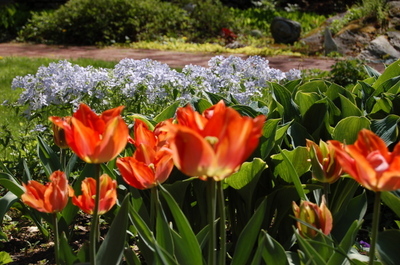 It only takes a vacation away from the garden to realize how vigorous the garden really grows. Not just the cultivated spoiled plants in the garden but also the weeds, the grass, the vegetables. One week is not a long time unless you are a dandelion. I say 'dandelion' as that is one of the most recognizable of weeds but really, the cucumbers can triple in size and the zucchini flowers turn into wiffle ball bats in just a week. It doesn't matter how neat and tidy you leave the garden, when you return, it is overgrown. The edges are blurred. Coming home is as wonderful as leaving on vacation and seeing the garden take over is just its revenge on you for leaving. I don't mind. I love to walk the garden upon my return to see new blooms fully unfurled, the senescent flower blossoms which now need deadheading and even those wiffle ball zucchini bats are gratifying. There are chores to be done. The gardener is needed. Being needed is always a good feeling. The light in the garden says spring but the temperatures are those of early February. Change comes fast in March and April, usually. The light levels indicate that preparations for this year's perfect vegetable garden must begin. There is one component absolutely necessary for a vegetable garden. A garden can have perfect soil with the best mix of compost, sand, silt, and clay along with the larger pieces of minerals in the form of rocks and pebbles. The micronutrients and microorganisms may all be present in abundance all ready to aid in plant growth but, without light, all is naught. Sunlight is necessary for high vegetable production. There are a few vegetables which will take less than full sun and still produce. Lettuce and some of the cole crops will produce with a half day of sun and lettuce actually needs a bit of shade during the high light days of summer. Gardens are not static, never done, always evolving and growing, and mine is surrounded by trees. Beautiful mature oaks, white pine, a few maple. Mostly oaks and oaks, white, black, and pin are wonderful shade trees with deep roots. You can always plant under the shade of an oak but you cannot plant vegetables. Not with great success. The past few decades have been wonderful for tree growth as evidenced by the growth rings on the latest victim. This stately oak was starting to cast a shadow on the garden. It had a beautiful form and it will make beautiful lumber from the bottom trunk and it will also share its warmth as the wood is burned in the wood stove next January. It has not gone to waste. Taking down a large tree can be a major project especially if it is located in close proximity to a house or barn. Thankfully, I now have two Equipment Managers. Husband and son took down two oak trees on Saturday last. A tractor comes in handy if there is any breeze which may misdirect the landing zone. Chainsaw and tractor, along with very handy men made short work of downing the trees. Taking the trees down is the easy part. Taking them apart requires much more time and effort. I believe it was Henry David Thoreau who wrote the words "Chop your own wood and it will warm you twice" referring to the chopping and then the burning. Even with a chain saw it is still a job which requires energy and produces a bead of sweat on the brow but it is also a job which produces a tangible and satisfying conclusion. Wood on the hearth and light for the garden. Here is a video of the procedure. The commentary is directed at my filming companion, 2 year old Hailey, who watched her Dad and Papa take down a tree on a very cold March morning. Here is what is left of the other oak. You can see how much work still needs to be done before the corn is planted in this patch. 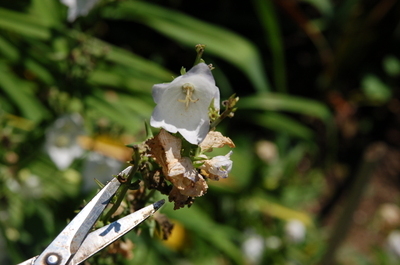 Deadheading, the process of removing spent flower heads, takes a bit of time but it is a job well worth doing! 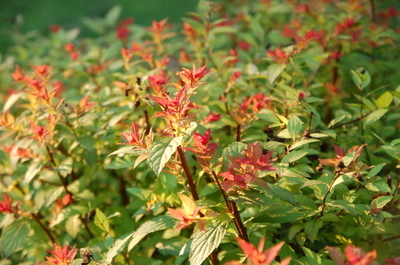 The above spirea, Spirea 'Magic Carpet' settles into summer with bland coloration and some really dried up looking flower heads which are not only unsightly but are also great in number. This picture taken on May 5th of this year! 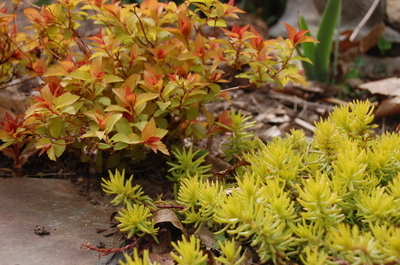 would go very well with the new spring growth of this spirea don't you think? so you can get between the stalk and the passed bloom making sure not to damage the emerging bud. If you keep deadheading you will be rewarded with an extended bloom time but this one is labor intensive. The plant will reflower although not with its' original magnificence but, it is still satisfying. 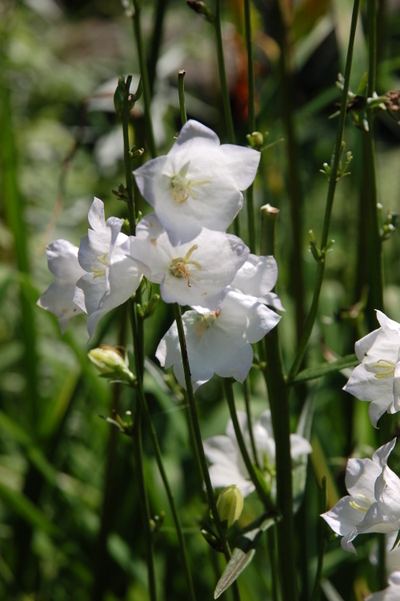 Other perennials and shrubs which I do try to deadhead religiously are the alchemilla or yarrows, the bee balm, hosta, phlox, delphinium, potentilla and salvia to name a few. 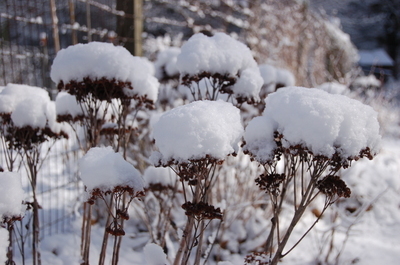 I do leave the seedheads on certain perennials such as Sedum 'Autumn Joy' as it looks so nice with snow on it adding to winter interest in the garden. What plants to you deadhead on a regular basis and with great success? Once people find out that you love to garden, the inevitable questions begin. I look forward to the questions. Advice is often solicited from friends, relatives and, on occasion, perfect strangers. It can be anything from "How come my tree died?" to "I have a green, leafy plant, do you know what it could be ?". A full range of questions. Lawn questions are always at the top of the list. My lawn, I use the term very loosely, is really more of a collection of weeds. Dandelions, ajuga, moss, and more abound but it is usually some shade of green and the dog loves it in spite of the weeds. I know what to do but I just haven't paid attention. The lawn has now become an embarrassment, The gardens have always come first. There is always something else that needs to be done. I confess, I don't always follow my own advice. I always recommend a soil test before fertilizing but it has been quite a while since I have actually tested my own soil. I have it on the 'to do' list! Many people say that a lawn is not practical but, a lawn is serene. It sets off a garden bed. It creates a green, negative space which is inviting to pets, children and the picnic table. I've never had the perfect lawn but I would settle for a bit of clover, instead of all the rest, mixed in with the bluegrass. Organic fertilizers are all the rage now and four step programs, which were formulated for the synthetic fertilizer market, are loosing favor. Thank goodness. I think I might be able to manage the organic approach ( I have a lot of compost) although it does include some hard labor. 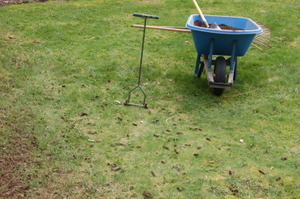 When asked what can be done to improve a compacted lawn, my answer has been to use a core aerator which will pull out a plug of soil and to then spread some compost to fill the holes. This will add microorganisms into the root zone and also improve the soil structure, among other things-I know, how boring! I much prefer manual equipment to power equipment. Today I used the core aerator, the 'step on it' kind in this picture. I 'stepped' so many times, I think that I could have climbed the Empire State Building. Then it was on to shoveling the compost which was spread and then raked into the holes. To me, there is nothing more gratifying than spreading compost. We each have our own thrills! This will be an ongoing process, one which will never be complete but I hope to actually have a healthier lawn. 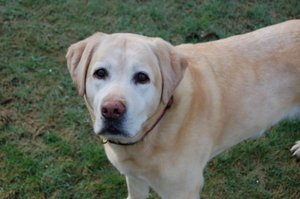 Tucker, the dog, couldn't be any happier!